The Fibonacci levels are drawn automatically. The Fibonacci extensions are drawn automatically. You can choose between 4 solid trend indicators to base the Fibonacci levels on. The rare Fibonacci levels based on time are also available. This example shows the Fibonacci levels after a positive (bullish) trend. The Fibonacci levels (the horizontal blue lines) based on the trend are obtained by connecting the lowest and the highest point of the trend when the trend has ended. Exponential moving average and market price cross. This example shows the SuperTrend indicator. If the SuperTrend is bullish, the chart background is green. If the SuperTrend is bearish, the chart background is red. The last completed trend was bullish (green). The Fibonacci levels and extensions are automatically drawn when the trend ends. They are based on the high and the low point of the completed trend. This example shows the Univers-Bourse trend detector. Light green (or light red) is the start of a trend, dark green (or red) is the confirmation of a trend and white is sideways and thus also the end of the trend. The last completed trend was bearish. The Fibonacci levels and extensions were automatically drawn when the trend ended. They are based on the high and the low point of this completed trend. This example shows crossing moving averages to determine the trend. If the trend is bullish, the chart background is green. If the trend is bearish, the chart background is red. The last completed trend was bearish (red). The Fibonacci levels and extensions were automatically drawn when this trend ended and are based on the high and the low point of this completed trend. 4. This example shows the cross between an exponential moving average and the market price used to determine the trend. If the trend is bullish, the chart background is green. If the trend is bearish, the chart background is red. The last completed trend was bearish (red). The Fibonacci levels and extensions were automatically drawn when this trend ended. They are based on the high and the low point of this completed trend. This example shows Fibonacci levels based on the current week. It is Tuesday so the Fibonacci levels are based on the high and low of Monday and Tuesday. The extensions are always drawn based on last week’s Fibonacci levels. 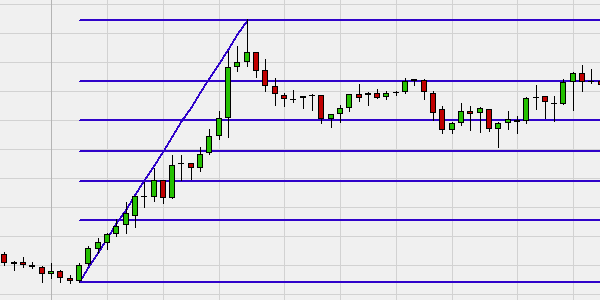 Learn how to draw Fibonacci levels... download a free real-time NanoTrader demo.